It was not merely because astronomy was a fascinating science that it was studied with ardor by saints and doctors. Aside from the inspiration afforded by the contemplation of the wonders of the starry vault, there were also practical considerations which moved the authori­ties at Rome to encourage the study of the heavenly bodies. Chief among these were the demands of chronology, and the necessity of accurately regulating the various festivals of the ecclesiastical year. As far back as the time of St. Polycarp, in the second century, there was a dispute as to the time when Easter should be celebrated. The question was taken up by Pope Leo the Great, and, later on, by Nicholas V, Sixtus IV, and Leo X, but without any satisfactory re­sults. Not until 1582 was the contro­versy settled, when Gregory III pro­mulgated the reformed calendar and made it obligatory throughout the Catholic world. The building in which the work of the reformation of the calendar was executed forms a portion of the immense pile of buildings in Rome known as the Vatican. The upper portion of the structure, in honor of its projector, Gregory XIII is called the Gregorian tower. Connected with the Vatican library, and, indeed, forming a part of this wing of the papal palace, it rises considerably above the adjacent portions of the edifice. It is a large and massive structure, containing more than a score of spacious apartments, and is, in every way, well adapted for the purposes of astronomical work. The room in which the calendar was reformed is preserved in essentially the same condition in which it existed in the time of Gregory XIII. 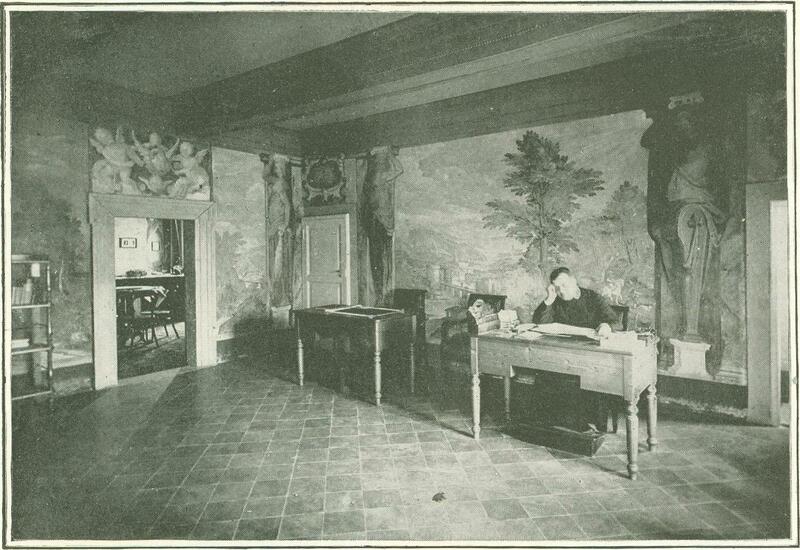 It is remarkable not only for its size, but also for the beau­tiful frescos which adorn the walls and ceiling. These, although several cen­turies old, are still in an excellent state of preservation, and fully in keeping with the other admirable works of art, which constitute so conspicuous a fea­ture of the magnificent palace of the Vatican. In the floor, in the center of the cham­ber, is a large slab of marble in which is executed the celebrated meridian of the noted Dominican, Ignazio Danti, one of the commission appointed for the refor­mation of the calendar. By means of this meridian and a small aperture in the wall, through which a solar beam was permitted to enter, he was able to demon­strate the necessity of reforming the cal­endar, and the exactness of the system proposed by one of his associates, Luigi Lilio, of Calabria. The orifice through which the sun's rays were admitted ap­pears as a minute white spot in the en­graving, on the left hand side of the pic­ture. The calendar room, as it is called, is now used for the weekly meetings of the Vatican Astronomical Association, a society composed of the staff of the ob­servatory, together with a number of other savants interested in the advance­ment of astronomy, meteorology, and terrestrial magnetism. These reunions are usually presided over by his emi­nence, Cardinal Mocenni, assistant sec­retary of state, who is the Pope's ordinary representative in the general man­agement of the observatory. After the completion and promulgation of the Gregorian cal­endar, the Vatican Observatory under­went various and nu­merous vicissitudes. The work which had been commenced so auspiciously, and from which so much was expected, was gradually discontin­ued, and finally all regular observations were abandoned. The instruments were neglected or dispersed, and in the course of time little was left but the building itself. Many efforts were made at diverse times, especially during the pontificates of Pius VI and Pius VII, to restore the observa­tory to its former condition, but the most earnest efforts were attended with only partial success. It was reserved for Leo XIII to bring to a successful issue what had before been so frequently attempted but without se­rious or lasting results. 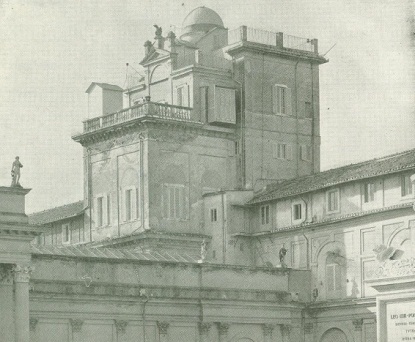 On the occasion of the memorable Vatican exposition, held in 1888, in honor of the fiftieth an­niversary of Leo XIII's elevation to the priesthood, the idea of reorganizing the observatory took a definite and practical form. The building was immediately ren­ovated and enlarged. In a short time, not only was the building in condition, but the instruments were in place, and everything in readiness for systematic and continuous observations according to the latest and most approved methods. That the observatory might not again be exposed to the vicissitudes which had marked its previous history, Pope Leo endowed it with a sum ample to meet all current expenses, and set aside certain portions of the Vatican palace and gar­dens for the special use of the observa­tory. Near the Gregorian Tower he gave a suite of rooms for the reception of a large heliograph and its appurtenances. This instrument, used for photographing the sun, is an exact duplicate of the one employed by Janssen in his observatory at Meudon. 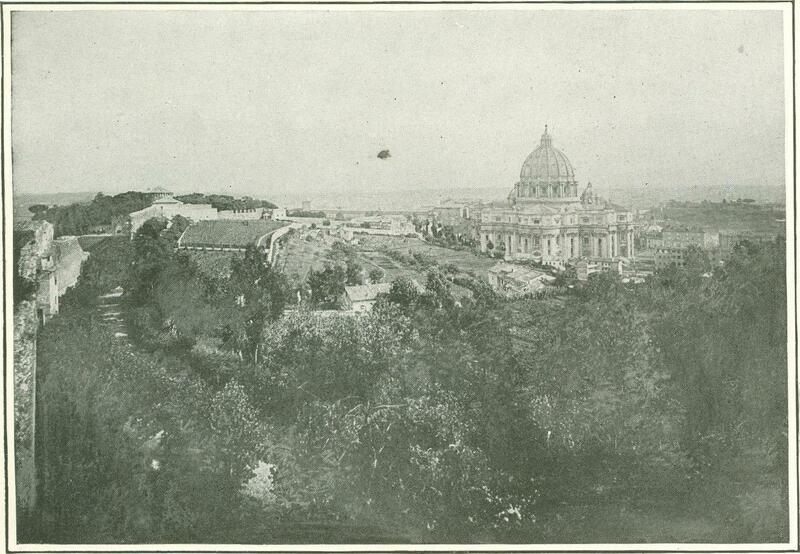 Besides the rooms reserved in the Gregorian tower for meteorological observations, place for such observations was likewise provided at a lower level in the Vatican gardens. But by far the most important addition to the previously existing observatory was the famous Leonine Tower on the summit of the Vatican hill. 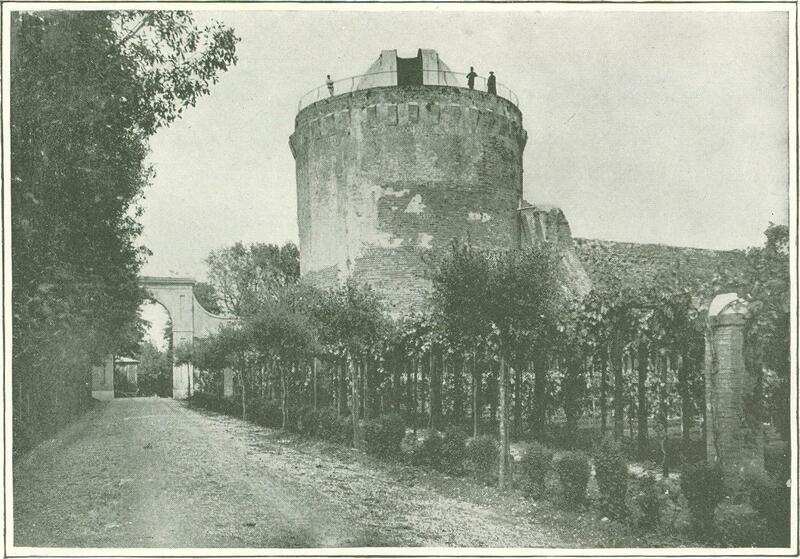 This was constructed in 848, by Leo IV, as a fort­ress against the inroads of the Saracens, and is admirably adapted for the purposes of an observatory, being remarkably free from vibration, and possessing a clear horizon. In solidity this venerable tower is al­most comparable with the pyramids of Cheops and Chefren. Its internal diame­ter is nearly sixty feet, while the walls at the base are: no less than fifteen feet in thickness. There are three stories, two of which are arched over with heavy ma­sonry, whilst the third supports a large revolving cupola of the latest design and best construction. This structure is about a quarter of a mile distant from the Gre­gorian tower, and offers one of the most beautiful and commanding views to be had anywhere in the Eternal City. It is, indeed, from this point that one sees St. Peter's as it was conceived by Michael Angelo, and as the great architect desired it to appear from all sides. Ow­ing to a change in the plan of the build­ing, made without his approval, the magnificent dome of the great basilica is not seen to advan­tage from the front. It must be viewed from the rear to have an accurate idea of its grandeur. The two lower stories of the Leonine Tower are set apart for researches in ter­restrial magnetism and seismology. In the upper story is placed a large photo­graphic equatorial, in size and design like the great instrument in the National ob­servatory of Paris. 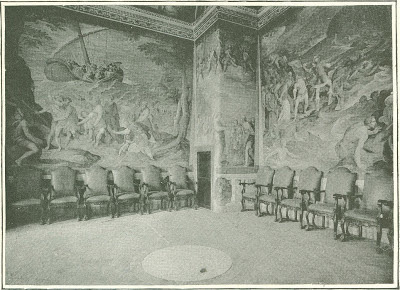 The chamber in which the equatorial is placed is provided with clocks, barometers, etc., while in adjoining rooms are all the appliances requisite for exact and systematic work in celestial photog­raphy. Just now, the as­tronomers of the Vatican Observatory are busily engaged in executing their part of the colossal international chart and catalogue of the heavens. In 1887, the astron­omers of the world resolved to make a photographic map of the entire surface of the stellar sphere. This stupendous work, involving the taking of more than forty thousand pho­tographs, was appor­tioned among eigh­teen of the chief observatories of the northern and southern hemispheres. To each obser­vatory was assigned a certain zone of the heavens—the zone which, consider­ing the altitude and longitude of the observatory, could be photographed with the greatest convenience and with the best results. The zone assigned to the Vatican observatory embraces that por­tion of the heavens comprised between 55° and 64° north declination. Each observa­tory will take two series of photographs—one for the chart of the heavens, and the other for a new catalogue of the stars. The number of pho­tographs to be made by each observatory de­pends on its lo­cation. Those in the southern hemisphere, on account of the comparatively limited number of stations, will have more to do than those north of the equator. Thus, while the astronomers of Catania and Helsingfors will be re­quired to take but 1008 photographs each, those of the Cape of Good Hope will be obliged to make no fewer than 1512. The number to be taken by the Vatican observatory amounts to 1040. Of these, more than four hundred are now ready, all of which have been pronounced by the central committee in Paris to be of the highest order of excellence. It is estimated that it will require two years more for the Vatican astronomers to complete the task assigned them. As may readily be imagined, the work pro­ceeds slowly. The time of exposure of the plates to be used in the preparation of the new catalogue of stars, need not be more than a few minutes—ordinarily, five or six—as it is not the intention to take cognizance of stars which are less than those of the eleventh magnitude. In the chart, however, much smaller stars will appear, as it has been decided that it shall exhibit those even which are only of the fourteenth magnitude. The exposure for such faint objects varies from one to two hours, depending on the condition of the atmosphere. Some of the photographs of stars and nebulae which have been taken in the Leonine Observatory required an expo­sure of no less than nine hours. During all this time the operator was obliged to keep in a reclining posture, with his eye always at the ocular, and his hand on the rods designed for moving the telescope in right ascension and declination. The in­strument is, of course, turned by clock­work, but, accurate as this is, it is found necessary to adjust by hand the slight ir­regularities of motion which are inevitable even in the most perfect equatorials. The photographs for the catalogue and chart of the heavens are taken on speci­ally prepared plates sixteen centimeters—about six inches—square. In order that the position of any given star may be de­termined with readiness and exactness, each photograph is crossed by a number of fine lines at right angles to one an­other. 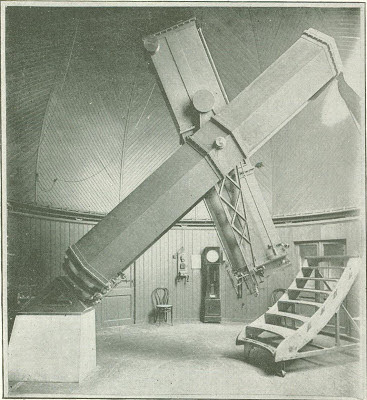 And for the purpose of locating rapidly and accurately the position of the countless stars in the catalogue, the brothers Henry, of the Paris observatory, have devised an ingenious instru­ment, known as the macromicrometer. One of these is used in the Vatican Observatory. But although the principal work of the Leonine Observatory at present is the taking of photographs for the mammoth catalogue and chart which is in course of preparation, it is not the only work. Photographs of the other heavenly bod­ies—of the moon, the planets, of comets, and nebulae—are also made. Some of these, indeed, are such splendid specimens of work that they have elicited the unqualified admiration of all who have seen them. Considerable attention is also given to the photographing of stellar spectra, and it is the intention of the astronomers in charge to make this a prominent feature of their future work. A series of cloud photographs has like­wise been secured, of great interest to meteorologists. The Gregorian tower is singularly well equipped with instruments for investiga­tions of all kinds. It is well provided with the latest patterns of automatic in­struments, particularly in the apartments devoted to meteorology. The library is already quite large and is rapidly increas­ing in size and importance. It receives the published reports of more than three hundred observatories in all parts of the old and new worlds, and in exchange for them it sends out to its correspondents the results of its own labor. Leo XIII, as founder of the Vatican observatory, has always manifested the liveliest interest in the work which is there being accomplished, and is ever ready to do anything in his power which may subserve its interests or conduce to its betterment. I shall never forget the enthusiasm with which he spoke of his specula—the Italian word for observatory —on the occasion of an audience which I recently had, nor the profound interest which he exhibited in the general ad­vance of astronomical science. He is thoroughly informed as to what is being done, and feels a satisfaction in the fact that the specula Vaticana was one of the first to propose participation in the inter­national undertaking of photographing the heavens. When I spoke to His Holiness of my in­tention to write an article on the observa­tory for The Cosmopolitan, he seemed especially pleased. “Va bene”—good— he said; “I trust you will find it compares favorably with other observatories." I replied that, having visited the chief observatories of Europe and America, I was in a measure familiar with their equipment, and that the observatory of the Vatican bore comparison with the best of them. "I am glad to hear this," resumed the venerable pontiff, "for I am much interested in the observatory and the work which is being done in it; and it is my desire that it shall in no wise be inferior to the most noted of the world's observatories. A noble study is the sci­ence of the stars, and one which cannot be pursued with too much ardor." Leo XIII attaches the greatest importance to the study of astronomy, and has at heart the cultivation and advancement of sci­ence in general. 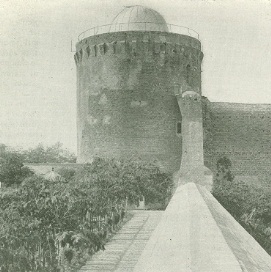 It may, perhaps, interest the readers of The Cosmopolitan to know that although Leo XIII has visited the Leonine Tower, he has never been inside of the Gregorian Observatory. His first view of the inte­rior of an institution of which he may justly be considered the founder, will be through the pages of the magazine con­taining this article. It may also be stated, in this connec­tion, that the illustrations accompanying this article are from the first photographs ever taken of the interior of the observa­tory, and that these were prepared ex­pressly and solely for this article. For permission to have the photographer enter the observatory and the Vatican gardens, the writer is indebted to the kindness and courtesy of the Pope's major domo, Mgr. de la Volpe. In 1891, there was struck a medal,—a masterpiece by the distinguished engraver, Bianchi,—which records the insti­tution of the Vatican Observatory, and at the same time declares to the world the service rendered by this pontifical Maece­nas, not only to astronomy, but also to all the physical sciences as well. The president of the administrative council of the Vatican Observatory is Cardinal Rampolla, secretary of state. From its foundation he has shown an ardent and active interest in everything that concerned its well-being, and it is not an exaggeration to say that much of the prestige which the observatory now en­joys is due to the hearty and intelligent manner in which he has entered into every proposition which was calculated to place this favorite institution of Leo XIII among the great observatories of the world. But much as has been done for the observatory by the Pope and by Cardinals Rampolla and Mocenni, it could not have won the distinction it now enjoys but for its learned, zealous, and indefatigable di­rector, Padre Denza. From the opening of the observatory until a few weeks ago, when death suddenly put an end to his brilliant and useful career, the illustrious Barnabite was the soul of the observatory so far as the scientific world was con­cerned. It was he with whom astrono­mers and the directors of other observa­tories had to communicate when they desired information respecting the work which was being conducted. A profound mathematician, a skillful observer, a pa­tient investigator, an ardent lover of nature, he was, in every sense of the word, an ideal astronomer, and as such he was recognized by his colleagues throughout the world. Besides this, he had a prodigious capacity for work, and a genius for invention that would have made the fortune of another man. In­deed, some of the most valuable and ingenious instruments in the observatory are the product of his fertile brain. With all this, he was likewise a prolific writer. The author of numerous and valuable works on astronomy, geodynamics, and meteorology, he was besides a regular contributor to divers scientific publica­tions of both Italy and other countries. The founder of the Italian Meteorological Society, and for the past third of a cen­tury it’s director-general, he was also a member of a large number of scientific associations in foreign lands. 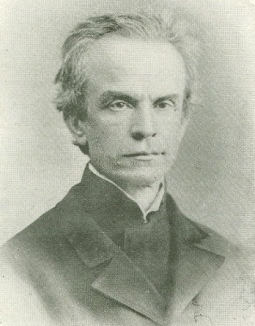 The rival of his illustrious friend, Padre Secchi, whom he resembled in many traits of character; the friend and confidant of Leo XIII, who keenly feels the loss of his de­voted astronomer, Padre Denza leaves behind him in his contributions to science "a monument more lasting than brass, and more sublime than the regal elevation of pyramids." He was, indeed, a true votary of astronomy, and it will be long before the void occasioned by his un­timely death can be filled. "Brav uomo!" said Leo XIII of him, in speaking to me only a few days before his demise. "Vir rei astronomicae et physicae scientissi­mus,"—a man thoroughly versed in as­tronomy and physics,—his friend wrote of him in the brief announcing the estab­lishment of the observatory of the Vati­can. And no one who is familiar with the lifework of Padre Denza will impugn the truth of this characterization, eulogistic as it is. As to his associates in the astro­nomical world, they will, I am sure, endorse it as a truthful tribute. From Greenwich to Rio de Ja­neiro his death will be de­plored as a loss to science. The assistant director of the Vatican observatory, and Padre Denza's prob­able successor, is Padre Lais, who has already achieved marked distinc­tion as a conscientious and successful investigator. Like his lamented master, Padre Denza, he is a ready and prolific writer, as well as a careful observer, and is the author of many con­tributions on astronomy and meteorology which are of acknowledged merit and permanent value. But important as are the achievements of the working staff of the obser­vatory,—they are nine in number, all told,—we can­not lose sight of him who made these possible. Af­ter a visit to the obser­vatory, I was returning from the Leo­nine Tower, where I had left Padre Lais engaged in his work of love,—photo­graphing the stars,—a prisoner for the night on his reclining chair, under the eye-piece of the superb equatorial. Slowly I wended my way through the solitude of the Vatican gardens, where all was solemn stillness, and passed around the imposing temple of St. Peter's. Presently I found myself hard by the venerable Egyptian obelisk in the Piazza di San Pietro. It was near the hour of midnight, and the piazza was entirely deserted. But high up in the Vatican the light in the Pope's study was not yet extinguished. Since he ascended the chair of St. Peter, Leo XIII has been untiring in his efforts to bring out in bold relief the natural and necessary alliance between science and faith. 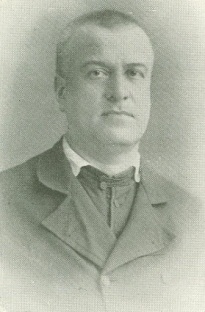 From The Cosmopolitan Magazine – 1895.